This post is the 3000th to appear here at Back of the Cereal Box. 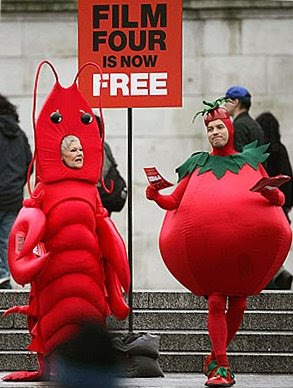 In celebration of this fact, I am offering you a photo of Judi Dench dressed as a lobster. Consider the fact that the photo also features Ewan McGregor dressed as a tomato a bonus. No clue. I needed a image of Judi Dench and this was the most appealing one that came up in the photo search. I'm sure there's an explanation somewhere online, though. I'm happy to suppose that this is what Judi Dench and Ewan McGregor do with their free time.